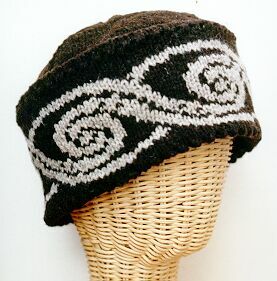 This hat pattern is knit from medium weight 100% wool in two natural colors: Brown and Gray. Designed to put three layers over the ears, this pattern is adapted from a hat style that has kept shepherds warm for years. It calls for four oz of medium weight yarn in the main color, and one oz of the contrast color.